Designed to support sensitive or over- reactive digestion on a daily basis and maintain overall health of the digestive tract. Maintaining optimum gut health & efficiency. Neutral taste – can be sprinkled or mixed with food or for fussy eaters can be rolled into a ball of wet food or made into a paste and given as a treat. An advanced blend of dietary fibres using an approved strain of Probiotics and Prebiotics in powder form with 10g scoop. Formulated for long term daily use, particularly helpful for pets with sensitive digestion or who scavenge. For sensitive bouts of digestion from anxiety or stress such as after a kennel stay, groomers or trip to the vets. A comprehensive digestive supplement which is designed to encourage normal digestive function over a long-term period. This probiotic, fibre supplement has active probiotic organisms that colonise the gut and help exclude potentially pathogenic bacteria. 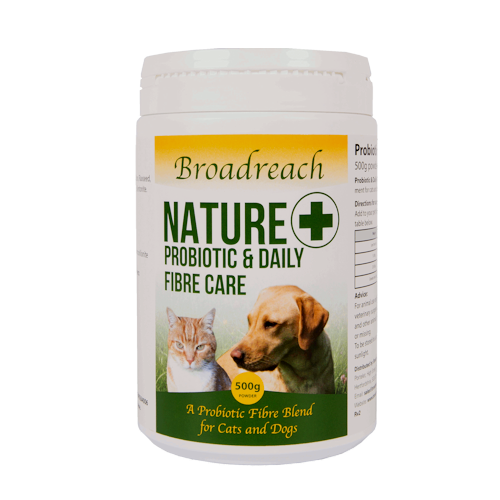 Probiotics – Containing double the amount of Probiotics than the market leading Brand, using the EU-Registered Approved Strain of Probiotics Enterococcus Faecium (NCIMB 1015 E1707 2 x 1010 CFU/KG 2 x 1010 CFU/g to help repopulate the intestine with beneficial micro-organisms that can also promote a wide range of health enhancing functions. They help keep bad bacteria at bay and may also aid digestion, absorb nutrients from food and contribute to a healthy immune function. Prebiotics – are non-digestible carbohydrates (chicory Root) in this case which act by promoting the growth and activity of probiotics in the gut. These consist of fructo-oligosacchardies to feed and stimulate the growth of beneficial bacteria. Insoluble Fibre – Doesn’t dissolve in liquid or in the gut but can absorb liquid and acts as a bulking agent in firming up stools. This helps promote regular bowel movements. Bentonite Clay – This clay has a range of nutrients and an abundance of minerals including calcium, magnesium, silica, sodium, copper, iron and potassium. When ingested these vitamins and minerals are absorbed. As a lot of electrolytes are lost from the body during bouts of digestive upset this could potentially help with replenishing them. Vitamins & Minerals – An abundance of essential vitamins and minerals are contained in this product to help support overall gastro-intestinal health & general body condition including Vitamins A, B12, C, D, E & K, Calcium, Potassium, Magnesium, Beta-Carotene, Fatty Acids, Silica, Sodium and Iron.